Trance Film Review "No Piece Of Art Is Worth a Human Life"
"No Piece Of Art Is Worth a Human Life"
So on 6th April 2013 I saw Trance now I knew I wanted to see this film as soon as I saw the first trailer for it, Trance trailer one it's called as there are many other trailers released for this film. I just kept replaying the trailer over and over again one because of the film, the actual trailer and the music used in it, it just really connected well with it. Another reason I wanted to see this film was because of James McAvoy, he is one of the main characters in it. So I was basically sold with this right from the beginning the only thing I was worried about was the violence because it was my first Danny Boyle film. Now I'm not trying to be horrible to him but I know that in his films there is violence, I can only take so much but having seen the film now, I can say that if you are worried about it in my opinion there isn't that much, to me I can cope with the violence used in this film. Also I was told that Danny Boyle's films are more of a psychological thriller so I was pleased about that. The gist of the plot of the film without giving too much away is, it's about an art auctioneer called Simon played by James McAvoy. He gets caught up with a gang of criminals, the criminals partner up with a hypnotist in order to retrieve a lost painting. The leader of the gang Franck is played by Vincent Cassel and the hypnotist, Elizabeth is played by Rosario Dawson. While I was heading to the cinema I found myself feeling excited and a tad nervous but a good nervous because it was my first Danny Boyle film. Seriously if this is your first Danny Boyle film or you are thinking about going to see this film, go and see it, I highly recommend it. I heard Danny Boyle say in his interviews for this film that it's hard to fit in one specific genre and it is, I agree with him by the end of the film there is so much going on that it is difficult to put this film in one genre. To me it is many but I think that if you like drama, thriller and crime films then this is for you. James McAvoy said that by the end it takes on an action genre and it does so if you like action films too then again this film is for you. Now as I said earlier one of the reasons I wanted to see this film was because of James McAvoy. After seeing this film my love just keeps growing for him even more, if that's even possible. His acting in this is amazing and incredible, this is another one of his films I would recommend if you haven't seen him in anything. Vincent Cassel's acting in this I also really liked I thought he did an amazing job. He's a French actor but he speaks English really well and his character Franck isn't a good character because he is the main member of the gang and at the beginning of the film I wanted to blame him for hurting Simon because SPOILER ALERT Franck is the one that hits Simon in the head which causes Simon to fall and hit a wall, so it was his fault I wanted to blame him END OF SPOILER. By the end of the film I didn't want to blame him and you won't either you will blame another character as did I. 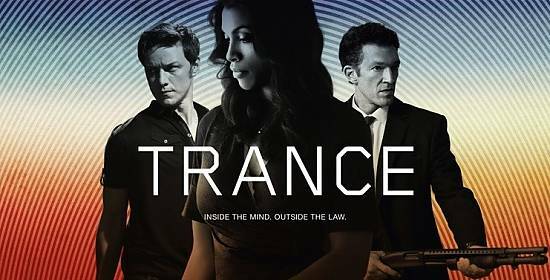 This was the first film I had seen Vincent Cassel in I think and I really liked him in Trance especially at the end. 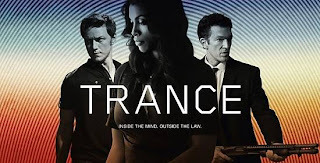 Now Rosario Dawson this was the first film I had seen her in and I thought her acting was incredible in this she really fitted in really well with Simon and Franck. Her character Elizabeth makes you feel so many different emotions towards her that by the end you won't feel what you felt for her at the start of the film, you will end up not trusting her and hating her character. This is a film with so many twists and turns sometimes it's hard to keep track of who is telling the truth? Who do we believe? Who can we trust? At the beginning of the film Simon is the narrator of the film but when his world turns upside down we don't know who is the narrator or who to believe. With so many twists and turns and the mixture of reality and hypnosis sessions merging and blurring together it's difficult to separate them and place them into a real world when they keep crossing together a lot. However by doing this you can't take your eyes off of the screen for a second in case you miss something important, it really is on the edge gripping intense scenes. The scene I especially like is the car scene with Simon and Elizabeth, Danny Boyle keeps going back to it each time in order for the audience to pick up new information that we didn't see the first time. I just thought that was really clever. Each time you think you have the plot after so many twists and turns Danny Boyle snatches it away. One of my favourites quotes from the film is " No Piece of Art Is Worth a Human Life" I just love it because it's the truth Simon says it a lot at the start of the film and you learn a lot of information from this film. Overall I would recommend this film, one because of it's incredible directing, two because of the brilliant acting, three because of where it's mostly set in London :). Four because of cinematography and incredible colours used in this film and five because of it's amazing music in it. The music connected really well and Emeli Sande at the end of the film with her song Here It Comes is perfection I loved the music so much that when I got home I downloaded the soundtrack on to my iPhone and I'm listening to Emeli Sande's song Here It Comes while writing this review :).